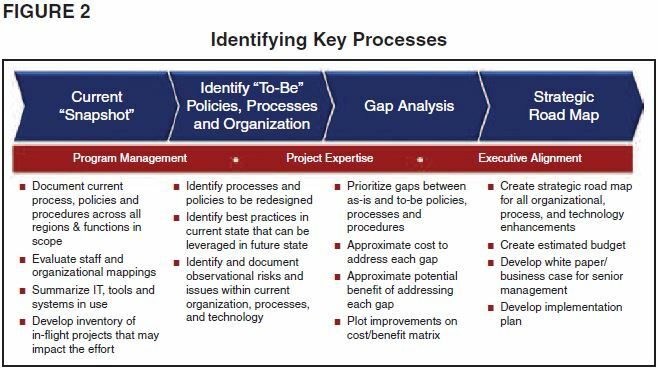 A four-step methodology focused on organization, process, policy and technology provides tangible results for organizations seeking to mitigate the impacts from experience and knowledge gaps in land functions. OKLAHOMA CITY–In the midst of the rapidly evolving domestic oil and gas industry, the land business has experienced a shift in strategy, with focus changing from acquisition to asset management. This shift increases requirements for deep expertise in land operations and asset management, yet throughout North America, looming retirements across industries are causing a shortage of experienced labor in the workforce. Although this widespread “knowledge gap” is not unique to the oil and gas sector, it brings a unique set of challenges to landmen across organizations, processes, and technology. Talent management is more important than ever, with the influx of new hires and exits of experienced managers. In fact, according to a study by the Center for Energy Workforce Develop­ment, in the next decade, 62 percent of the energy industry will have the potential to retire or leave their jobs. Additionally, for positions that are considered critical by the industry, 36 percent may need to be replaced because of potential retirement or attrition this year, with an additional 16 percent by 2020 (Figure 1). Effective utilization of technology such as land management and reporting systems is becoming increasingly im­portant to ensure the timely and accurate data needed to facilitate informed business decisions. Throughout the industry, companies are working proactively to address knowl­edge gaps, particularly within technical and operational areas. Land is a key func­tion within upstream operations and is experiencing significant challenges be­cause of these gaps. As North American shale exploration and extraction has grown, the land function has become an integral part of business development, asset acquisition, and asset management. Now more than ever, it is essential for onshore-focused organizations to ensure knowledge transfer from retiring and experienced employees to early career talent. Table 1 outlines challenges, drivers and impacts trending in land operations, particularly regarding operational ineffi­ciencies from nonstandardized and in­consistent processes. Improving process understanding and visibility that will promote a culture of greater participation and empower­ment. Organizations should begin by docu­menting all processes and policies through staff interviews to capture their current state. During these interviews, capture risks that have potential project impact to ensure the effort stays on time and in scope. The result is a thoroughly vetted set of process and subprocess flowcharts documenting land operations and related function responsibilities, touch points, and key tools. Setting expectations for time-to-­market and establishing data standards for reporting. An analysis of the gap between the current state and proposed future state is conducted next. Companies should eval­uate gaps within every process, policy, and procedure–including organizational structure and technological infrastrucure–estimate ramp-up times with asso­ciated costs between current and future states, and prioritize and communicate options and critical next steps before im­plementation. This prioritization should consider a relative cost/benefit analysis using quantitative metrics where possible. If quantitative analysis is not possible, organizations could evaluate the relative impact of addressing each improvement area in terms of effort (e.g., resources, timeline, budget) and benefit (e.g., oper­ational efficiency, risk reduction, reduced learning curve). Before implementation begins, it is critical to gain cross-functional leadership alignment on the effort’s strategic direction. Implementation includes developing all identified deliverables, along with creating a training and change management plan for the organization. Internal Web-based interactive por­tals to store all deliverables in a user-friendly interface. These tools not only will help early career and experienced employees tran­sition into organizations, but they will institutionalize the way the organizations conduct business, enabling an efficient, streamlined, and competitive operation. 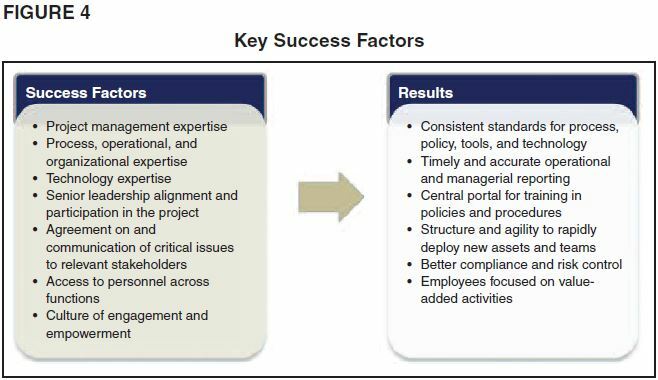 Evaluating an organization’s technol­ogy is key to both supporting land’s im­proving processes and arming manage­ment with visibility into operations (Figure 3). was the standard for managers to check work products for completeness and ac­curacy, but also the tool used to track employee productivity–important objec­tives that managers achieved through this imperfect methodology. Too much time is spent managing multiple, redundant spreadsheets. Document processing is sequential, rather than simultaneous, resulting in a slower process. Documents flow in bulk, so bottle­necks at one role result in an avalanche of documents for the next role. These process inefficiencies can be avoided. Technology not only enables, but demands a different style of manage­ment in the land back office. his approach works particularly well for leases, but can be used for any kind of land document processing, including agreements, assignments, regulatory no­tices and proposals. It can be customized further to establish data standards to pre­vent documents not meeting defined cri­teria from proceeding through a process (e.g., missing or incongruent dates, un­acceptable provisions, acres and bonuses that do not reconcile). With this approach, managers can become selective and per­haps choose to perform a detailed review of only a sample of documents versus reviewing every document. The final component in this approach is to integrate workflow with the lease records system. Where possible, compa­nies should index each lease record with a lease form that has preset provision mapping that corresponds with provision codes in the lease records department. This practice drastically reduces keying errors and omissions that could be costly for future reporting. Next, the workflow should upload the approved record (lease, contract, well, etc.) into the property system. This elim­inates time spent on basic data entry of names, dates and provisions, and allows analysts to focus on value-added activities such as quality control, record completion, analyzing provisions, reconciling acreage, and reporting. Oil and gas companies achieve these objectives through an enterprise lease records system or through their own so­lutions that offer the flexibility unique to each implementation. Integrating the workflow with the lease record system does not eliminate errors. Errors can occur during record edits or exceptions to uploaded records. The solution is to anticipate and quickly highlight errors as they occur. A substantial number of errors could be eliminated by defining quality control points that identify exceptions to business norms. Improve morale and job enrichment. Tract status is held by production, or producing, but acreage is categorized as undeveloped. Tract status is held by production, or producing, but no well is related to tract. Lease is beyond its primary term, but no well is related to any tracts. Well status is plugged and aban­doned, but the related tract is still active. Wellbore and overriding royalty interest rights are counting (accumulating) acreage. There are records without linked images/documents. There are royalty rates outside ac­ceptable range. There are duplicate recording data, no recording data, or missing or incon­gruent dates. Payments do not match obligations (bonus, option to extend, etc.). There are well working interest/net revenue interest anomalies, and/or con­tradictions in record type, status and acreage category. Monitoring exceptions by using control points requires an appropriate system in­frastructure and land skill set. Technology never will remove all human error, but investing time and dollars in technology will provide an organization with guardrails for practices and procedures so that data quality is not vulnerable. The use of technology in the land in­dustry has redefined the skill sets required in land operations and land administration. However, many companies may not be staffed with employees prepared for this change. The challenge, then, is for the managers to identify each employee’s unique skill set to maximize his utilization and create one cohesive skill set that services the organization. For example, land operations would benefit greatly from a landman who is strong both in negotiating deals and data analysis. However, a landman with these skills is not always available. Often, land-men will rely on land technicians or land administration staff to handle reporting. In turn, some companies may employ data specialists within their land admin­istration departments to specifically sup­port lease analysts and landmen with complex reporting requests and mapping needs. Another way companies adapt is by employing a business analyst in land to help managers identify and mitigate data vulnerabilities by building quality control queries or adjusting procedures. The business analyst may report directly to the land ad­ministration manager or land manager, or perhaps the business analyst is from the IT department. Business analysts would be tasked with building new enterprise reports to support land and other customers. Organizations can improve efficiency, effectiveness, competitive performance and talent retention by implementing and sustaining a set of operational and tech­nological changes across policy, process, and organization. Utilizing technology will help highlight exceptions and data quality issues, reinforce business rules, and ensure consistent utilization of sys­tems. These objectives can be challenging for many organizations (Figure 4). Considering a company’s needs not only today but for tomorrow, and realizing that the person leading land operations and/or land administration today may not be the same person two or three years from now are important considerations for growing a company. Turnovers of managers, landmen and analysts creates vulnerability in operations and data quality unless careful thought has gone into a company’s defini­tions of policy, process, organization, and technology. Leaders should prepare the company today, so they are not caught off guard tomorrow.